« 2-Stroke MIG Bike. No Afterburner. God Bless you Cyril. RIP knowing you made a difference. I am saddened. I loved Cyril’s motorcycles and followed this blog religiously. You will be missed. An amazing and very inspiring story, indeed. Rest in peace and thank you. Shock and deepest condolences to his family. Never met your father face to face but have been aware of him for my entire professional MC industry career which is now almost 30 yrs. His blog was my best source for the v-twin industry for the most part. I wish I had his connections. His knowledge was outstanding. RIP. 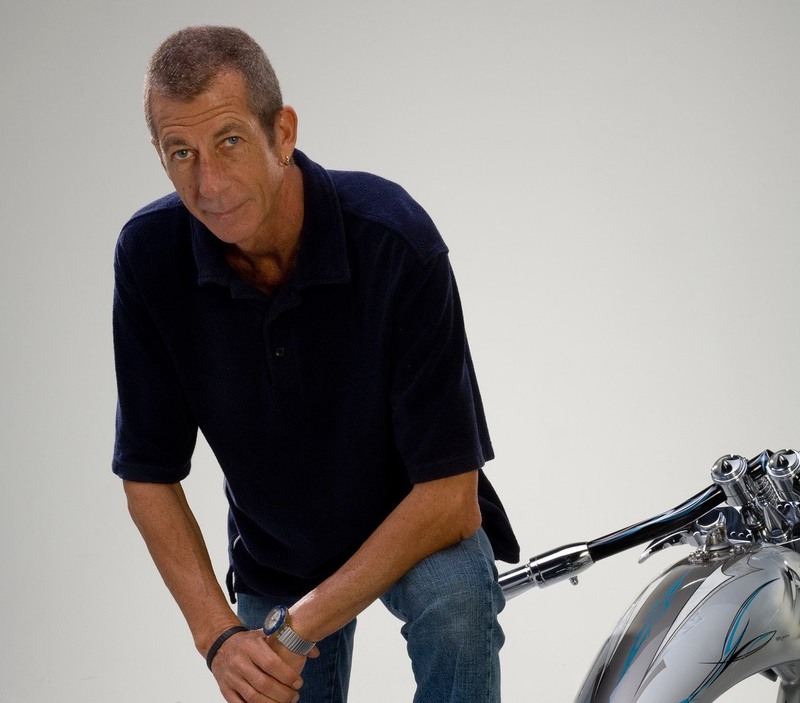 Thank you Cyril for your passion and many contributions to the custom motorcycle industry. You have helped our industry in so many ways. Rest in Peace my friend! Our thoughts and prayers are with you and your family. I saw your dad at many events over the years. A very unforgettable man! R.I.P. Cyril, your contributions to motorcycling will be sorely missed. I discovered Cyril’s blog only in the last year or two and was always impressed by his worldly knowledge and insiders view of the industry. Having read this tribute by his son, I am further impressed to learn that Cyril reinvented himself twice after leaving the advertising business (my previous business as well), both times with an amazing degree of success and respect for what he accomplished. It’s a real testimony to Cyril’s intelligence, diligence and professionalism. My condolences go to his family and close friends. Thank you for sharing him with us Damien. RIP Cyril. Condolences to his family. I am proud to have met you in Daytona, you made me feel like a million bucks! R.I.P. Cyril, your contributions to motorcycling are many!. Cyril meant a lot to me. Your dad, Damien, was uniquely wonderful. We all miss him. He gave life, motorcycling and the world a smile of well being. Thanks, Damien, for being his damn fine son. I am deeply saddened to learn this. I had the honor of meeting and speaking with Cyril several years ago at a Cincinnati expo and had a few exchanges here. A true gentleman, down-to-earth, and passionate about motorcycles. I am saddened that with his passing we’ve lost a bright light. In this day and age role models of the “capable individual” are increasingly harder to find. This is my favorite motorcycle industry site. My condolences to his family. truly sad news. His blog was really the only cycle one I ever read. Beautifully recounted as we say in America when the child resembles the parent–“The fruit doesn’t fall far from the tree.” May Cyril’s memory live on through you. So sad and sorry to hear of Cyril’s passing. He will be deeply missed. His eye for beauty and style were amazing… often copied and were talents that most designers could only dream and marvel at. RIP Cyril, you will forever be missed. Damien, thank you for sharing that lovely story of your father’s life and expertise. So many of us knew him professionally but he was so very circumspect and private – he seldom spoke of his many accomplishments. I am deeply saddened by the loss of Cyril Huze. Cyril was one of the first people I met when I started working in the industry on a national level. I always looked forward to seeing him at trade shows, or other events where we would get a chance to chat about the industry as a whole. He had so much to teach, and was always willing to share his enthusiasm for motorcycles and marketing. In an industry full of unique individuals Cyril always stood out. We will miss you Cyril, thank you for all that you did for the Motorcycle Industry and may you rest in peace. Thank you, Damien, for sharing this story. Cyril has left an indelible impression on the motorcycle industry and is already greatly missed. We appreciate everything he did for us and pass on our sincere condolences to you and the rest of his loved ones. May he rest in peace. My sincere condolences to the Huze family on the loss of such a great man. I considered Cyril a friend and he would call me occasionally to say hello and see what I was up to. I built a bike a number of years ago and dedicated it to him for all of his help and guidance. He had called me about it, to thank me, but in that he was still alive. I told him that the best tribute would be for one to see it, before one goes to build bikes in heaven. He agreed and we laughed about it. It hurts to hear that we will no longer see this wonderful man at events, or get his insights on the industry he so loved and enjoyed. God bless you Cyril. You were a businessman, artist and mentor to all of us. Damien … I never met your father, but through his writing, I felt I knew him. God bless you and your family. Gone but not forgotten. Condolences to his family and everyone who read his Post. He will be missed. Thanks, Cyril’s is a voice that will be missed. Cyril was a friend, even though I never met him. That’s because he shared his experiences and his talent with us and we’ll miss him, but we won’t forget his passion for the sport we love and we thank him for sharing that with everyone who cared. Godspeed Cyril. Thanks for sharing the story of Cyril, Damien and my deepest condolences to you and family. I liked Cyril a lot, we had some great rides and press introductions together, always shared the latest news (and gossip!) and had many good times, both here in Europe and in the USA. Really sad, gonna mis him…. Thank you Damien for such a beautiful and descriptive summary of your Fathers adult life. It is clear to me that his unique skills, creativity, vision and love for design are part of your core. I am very truly saddened by his passing! He was so non- judgemental, and open. A beautiful person. My prayers and thoughts go out to you, his immediate family. RIP Cyril! I am very sorry to read this news today. I knew something was up when the blog stopped getting updates in the first part of May. I very much respected your father and enjoyed working with him on several projects over the years, but like others, knew very little about his youth. Thank you for sharing this, and your dad, with us all. My sincere condolences to you and your family. Godspeed, Cyril. So sorry for your loss. Your dad was one of the most respected contributors to the V-Twin industry. His passion for the industry and stellar reputation will be hard to match. As stated above Cyril’s omnipresence and insight will be missed by the industry. At most important events one could look around the room and catch that unmistakable profile from afar. Although we had cocktails with mutual friends a few times and always spoke when we saw one another I regret that I didn’t make a greater effort to know him as a person. My loss. I am honored and blessed to have known and called Cyril my friend. Cyril was truly a blessing in my live. I will miss him greatly. Thank you for the info about Cyril. Please accept my condolence and know that the sadness you feel now when thinking about your dad will pass with time and memories will instead bring smiles. He will be missed by many. So Sad. I enjoyed his e-mails. He brought so much to us. Ci lascia un signore del custom e del motociclismo mondiale. Correrai su altre strade costruirai moto per gli angeli, sarai sempre una stella lucente. Merci pour ta contribution au monde de la moto. Sinceres condoléances à ta famille. Beautiful tribute to your father. Please know your father’s legacy will continue to live on in the motorcycling community. I thank him for all his insights. Bless you and your family. He is whole again. I was immediately drawn to your daily blog, and now after hearing the back story of your life, I truly understand why. What an amazing life you have had, and I thank you for your sharing it with us daily. God Speed Cyril, you will be missed. Shocking and saddening news… Motorcycle worl has lost one of their finest men. May you ride the wind until Eternity fades! Cyril.He graciously accepted and the show was a huge success. Sad news and we’ll miss him…Condolences to the family. Cyril was talented beyond measure and a gentleman. Sad to hear he is gone. This makes me want to cry. Followed Cyril for years. He was a good, decent human being. I will miss this wonderful man so much. We often shared a story, and always a hug! He was so kind and I will never, ever forget the smile on his face. RIP our dear friend. I was unfortunately a late comer to the Cyril Haze Post and was introduced by of all people, my motorcycle mechanic. The posts were from a rider’s perspective and not just a ‘what’s happening’ piece. Bon Voyage and may you enjoy the next part of your journey as much as we have enjoyed the journey you shared with us. Bon voyage et vous pouvez profiter de la prochaine partie de votre voyage autant que nous avons apprécié le voyage que vous avez partagé avec nous. Damien, so sorry to hear about your dad’s passing. Although I met him only a few times, it was clear to me he was a caring father, and a devoted biker/artist. I told him one time of my adolescent obsession with old school choppers back in the 1970s, and of my dream to own one some day now in my 50’s. His eyes lit up, “Dr Paul, we MUST build you a chopper!” Thank you Damien for sharing this. As a follower on Twitter, I stayed hopeful. Tremendous loss for you and your family. Even though I never personally met Cyril, after many years of visiting this site many times a day I felt like I knew him. He will be genuinely missed. We are all unique but some are a little more. Cyril was one of those, gifted with immense creativity, sensitivity and dignity. He certainly left his mark but like the rest of us, I’ll miss his voice. The only place I would turn for news of the industry and the man behind it all is now gone. So sad. Great writer, RIP Cyril and may your family find comfort in the fact that you will be missed by so many. OUR SINCERE CONDOLENCES TO YOUR FAMILY … MAT THE FUMES OF FUEL BE HIGH IN THE CLOUDS WITH YOU ! Cyril is missed by all already. R.I.P. Cyril – you will be very sadly missed. Damien, Condolences to you and your family! Cyril Huze was a visionary and a man who commanded respect. A true self made man who gave other something to look up too! God Bless Cyril Huze and his family. You may be gone but you won’t be forgotten. RIP Brother – fly with the angels ! RIP Cyril, you will be terribly missed! Damien, so sorry for your loss. God’s Blessings to you and yours! May the Lord surround you and the family with his love and comfort in this difficult time. What a great story and what a wonderful life to have lived. We should all be as lucky as Cyril. I too have spoke with your dad on several occasions and he was always very kind and that infectious smile of his made you feel like you had been friends forever. I hope you are riding one of your truly awesome bikes on the eternal highway full throttle. Great man, great motorcycle journalist. RIP Cyril. Never met him, but always admired him. I’m sure he’ll be building and riding Upstairs forever. Cyril was a very knowledgeable and influential man. He will be missed. Thank you for letting us know, Damien. Thank you Damien for sharing. Cyril’s vision of creating this spot here had a way of keeping the whole industry informed in real time. He was an immigrant entrepreneur with we both shared in those commonalities. I didn’t realize he was so ill. I will never forget him reporting on my son arose Tomas death in this blog and the overwhelming support. It helped me through a tough time. My only regrets is I never got to say good by my fellow dreamer and believer. We both gave up a lot to live our dream here in the US. Good bye Cyril. Cyril you will be missed. R.I.P. Cyril , I admired all of his builds and his great attention to detail . Never missed reading the weakly newsletter – I will miss it and perhaps his legacy will carry on . RIP Cyril, always and forever a fan! I followed you for years and read all of your posts.. your builds were amazing you will be missed .. fly high with the angels.. until we all meet up again .. my friend.. Sorry for your loss. Blessings to you and your family. I am sorry to read this news !!! I read thia blog from the first time that i met Cyril way back at a V-Twin Expo in Cincinnati . He remained an inspiration from then till now ! His smile and warmth will sorely be missed. I had the pleasure of knowing you dear Papa. He was always dear and warm when asking how I was and was genuinely concerned about many things. Just spoke to him at blings, feels like home when I saw him in Daytona. Won’t be the same without him. May God give you strength and ☮️. He had a certain joie de vivre and a spark in his eyes around bikes. Willie’s will miss him too. It’s be my honor reading your dad’s blog. For years it’s been the first thing I read in the morning. I will never forget the words of wisdom that Cyril shared with me. My son (although it was was won in my name) won the Cope Chop Shop contest in 2008 at Sturgis. Since it was won in my name, I was the point of contact. The cost to build the bike was $100,000. Cyril advised that there was very few bikes worth that much and told me it would be smarter to ask for 2 bikes instead. I did dicker with Cope, so I wasn’t ripped off in taxes. To this day, I am thankful and honored that Cyril took the time to help me with my issue. In 2010 I lost my son, I stayed connected through Cyril’s email and blog. Smiled when I received the emails. Good heart. Good man. You are forever in my heart. Cyril was a class act, I liked him and respected him. I first met him at a dealer show years ago and soon after, I bought some parts from him and got to see him at events like Daytona, and stuff… always nice to run into him, he was pleasant and fun to chat with. I will miss him, and remember him fondly. Thank you Damien. Have been missing Cyrils presence online. May he be in peace. John et moi avons eu le grand honneur de te connaitre, ce message est pour toi et ta famille. I was just listening to Carl Orff’s “O Fortuna” from his cantata, Carmina Burana, when I was reading Damien’s post about Cyril. How strangely apropos. Of all the motorcycle news sites I read, I enjoyed the Cyril Huze Post the most. Cyril, thank you for your contribution to this wonderful motorsport. You will be sorely missed. Rest in peace, my friend. It was a pleasure doing business with you for many years. De tous c’était mon préféré, le matin mon premier rdv était avec ce blog, sans le connaitre son auteur me paraissait proche, et je suis bien attristé d’avoir perdu un ami même s’il n’était que virtuel. Tu étais un vrai gentleman. Safe home, Cyril, safe home. First met Cyril several years ago in Sturgis. He acted as though we were life-long friends right from the start. He will be missed by many. Blessings to the family. Thank you for this beautiful and moving tribute to your father. I too had the good fortune of running into Cyril at the Indian Scout Reveal at Sturgis a few years ago and he was very friendly and treated his readers like good friends. C’était toujours un plaisir de parler avec Cyril. Damien Mes condoléances à la famille…….Always enjoyed meeting your dad in Sturgis..had lots of fun emailing him pics from the South of France back in 2015….iam sure they put a smile on face as he loved his French cars that he grew up around! I had the absolute pleasure of meeting and talking to Cyril at an event in Sturgis a couple of years ago. It was my honor to shake his hand. God speed sir. I’m sorry to hear of his parting. His website was my first stop of the day. I also feel sorry for his family. It looks like you, Damien, are now head of the family. Keep your head high and march forward. I thank him for giving us a forum to share our opinions good or bad. May he Rest In Peace. My condolences to you and your family, Damien. Being a journalist writing about bikes, i met your father on various occasions in Sturgis, and he always was a humble and admirable man. We will remember him. May he rest in peace. My condolences to you and your whole family. Used to see at Cyril at Daytona every year at Willies’ or down on the Boardwalk. Always a gentleman and never failed to say hello and chat a minute. I do hope you find a way to continue the blog. A very large number of us miss our daily dose of custom motorcycle news. let us know when you get going again. I really got a lot out of this blog. RIP Cryil and thank you for what you did. So what’s happening with the website? Is it going to continue as a tribute to the hard work put in by Cyril? Is it going to be sold? Cyril Huze Post is no longer posting new articles, however its archives are going to stay online indefinitely. R.I.P Cyril you will be missed . oh my, i am shocked and saddened all my best to his family and friends. I haven’t been on the page in a while as my main job has kept me busy but I am shocked to read this news. Cyril was the true leader in the industry and I was looking forward to talking to him this year at Sturgis. You will be missed, my friend. Cyril is missed. The term “one of a kind” is overused, but is completely accurate to describe him. This site is the only way I knew Cyril, but it has been one of the best motorcycle related sites ever. I was always on this site at least several times a week to look for anything new posted. Every article was always interesting. From reading his articles and about his travels, Cyril was an amazing guy and will truly be missed..
Yeah, true Shanedrive, Never met your father face to face, however, are conscious of him for my entire skilled megahertz business career that is currently virtually thirty yrs. His journal was my best supply for the v-twin business for the foremost half. I want I had his connections. His data was outstanding. RIP. Once again, Thank you Cyril..followed ur work and blog till the end, may ur soul rest in eternal peace. A true gentleman and credit to the industry. You will be missed. A incredibly talented man and a good man. It was an honor just to have met him in person many years ago. Condolences to his family and friends.